From left George Mangongo, DSI Godfrey Chimbwanda, Matifadza Mangongo and her mother Emmah Mangongo. 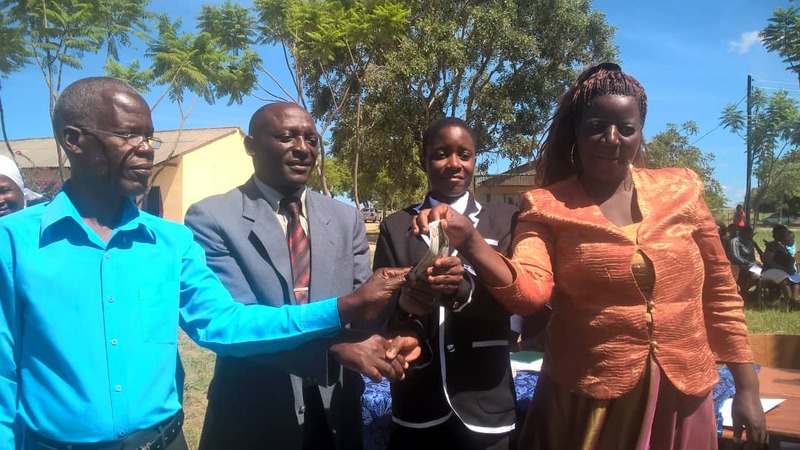 MURAMBINDA- A student at Murambinda B Secondary School in Buhera flew the flag high when she came sixth in the 2018 SADC Secondary essay competitions of 2018. Matifadza Mangongo got the recognition at the competitions that were held in Windhoek, Namibia on August 17, 2018. She was awarded a certificate. At National level she was on position 2 and was awarded US$300. Mangongo said that she is overwhelmed by her achievement and she has already started preparing for the 2019 essay competitions. She is doing Form 4. The handover of the certificate was graced by Dr Patrick Ngandini, an Education Research Officer from the Ministry of Primary and Secondary Education. He encouraged more schools to allow their students to participate in these essay writing competitions because they nurture them and help to develop a culture of research in their work. “We encourage all schools to enter these competitions because they help our students develop a culture of research in their work. Schools that do not take part should state the reasons why they are not allowing their students to write these essays. I am happy with what Matifadza did and I pray she continues on this path,” said Dr Ngandini. The District Schools Inspector, Godfrey Chimbwanda expressed his pleasure at the performance of both the student and the school. Mangongo’s parents, Emmah and George were present at the function. Murambinda B Secondary school head, Leonard Usavi expressed his joy at the achievement. Enter your comment... Well done. Continue to shine.